Jack Morris said he couldn’t remember what came first: a text, a phone call or an email. He just knows his phone wouldn’t stop buzzing this morning when word came down from the U.S. Supreme Court that sports betting would be allowed in New Jersey. 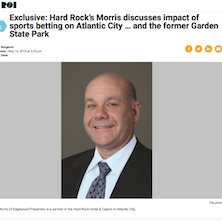 As one of the owners of one of the most talked-about new properties in Atlantic City in decades, the Hard Rock Hotel & Casino, it wasn’t surprising. In a sense, you could say Morris and his partners (Joe Jingoli and the Seminole Tribe that runs Hard Rock) hit the jackpot even before the former Trump Taj Mahal property is brought back to life June 28.